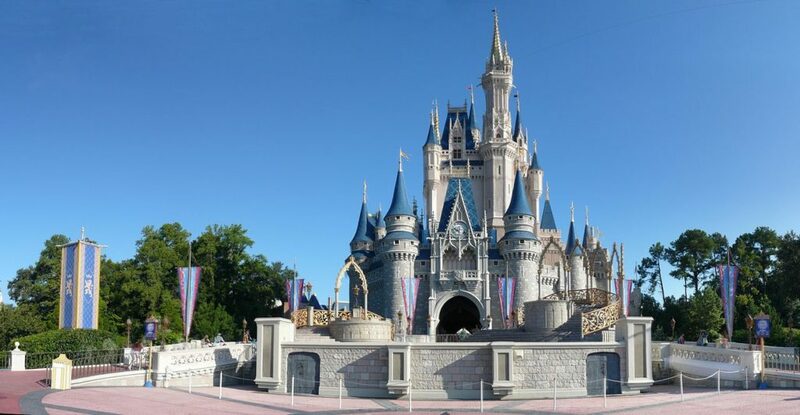 The Bibbidi Bobbidi Boutique in Cinderella’s Castle at the Magic Kingdom in Walt Disney World has become a “mecca” for young girls and their families alike. As a former Fairy Godmother of 4 months, I’ve seen it all! “Accidents”, incorrect reservations, head lice, and more “Birthday Princesses” than I can count! As someone who basically lived in the Castle, and was part of the boutique’s opening team, I can help steer you through some of the notorious pitfalls that face parents and girls when they prepare for their princess transformation. Many of you who are familiar with Disney know that all the good restaurants, and some of the events are by reservation only. However, that doesn’t stop hundreds of people every day who come in with bright-eyed girls asking for a makeover only to be turned away at the door with a dab of pixiedust when they’re informed that the Boutique is completely booked for that day. (407) WDW-STYLE, the Boutique’s reservation hotline, often informs callers that the Boutique is incredibly busy and often booked 180 days (6 months) ahead of time. Booking at the Boutique isn’t possible as all reservations are handled through the hotline. This also goes for cancelling reservations at later dates, switching Boutiques, and checking cancellations for that day, or following days. No, I’m not advising that you run through the Boutique, but that if you’re trying to get your name entered on the “Walk-in” list that you arrive promptly when the park opens and make a mad dash to the Boutique. Walk-in status is issued to the Boutique the morning of, for that day only, and often fills within the first hour that the park is open. So, if you’ve been unable to make a reservation, this is going to be your best and only option available. The Boutique opens at 8am everyday to accommodate those with RESERVATIONS ONLY! The benefit of scheduling a reservation this early is that most people arrive late due to oversleeping thus making it possible to get in and out with little, to no, wait. Does this mean early? NO. Showing up AT your appointment time is key because your appointment time is when you’re going to be seated. NOT BEFORE. The ONLY exception to this is rare instances when the Boutique is actually running ahead of schedule. Also, please keep in mind that I did just say RARE as most of the time the Boutique is operating 10-15 mins behind. And by showing up at your appointment time you’re guaranteed to not have to wait the additional 45 mins to an hour, or however early you decided to arrive. If You’ve got “IT”, Leave “IT” at Home. Part of your booking agreement is that your Princess is free from scalp/skin conditions when she comes for her makeover. Doesn’t mean that it’s alright to bring her when you gave her a “treatment” the night before. This means bring her when she’s completely free of, any, and all problems. The Boutique has the right to refuse, and often does, to work on anyone with a contagious condition that could spread to them. And while your child doesn’t have the Plague, possibly giving someone else poison ivy isn’t a great way of making friends. Go to the Bathroom Before your Visit! I shouldn’t even have to say this one, but considering some past circumstances, I feel it’s necessary. There are no restrooms in the Boutique. There’s no room for restrooms. The nearest ones are located past Cinderella’s Golden Carosel, between Ariel’s Grotto and Pinochio’s Haus. Make a pitshop there before checking in, or while you’re waiting to be seated. It’s a lot easier to do someone’s hair when they aren’t bouncing up and down because they have to use the potty. And this also keeps those embarrassing “accidents” to a minimum. There’s an Age Minimum for a Reason. The Boutique is specifically geared for little girls, but the age minimum is 3 yrs old, and we’d respect it if people wouldn’t try to fudge around this rule. We can tell when your child is younger than 3 yrs old namely because of their cognitive skills, responsiveness, and the fact that they won’t hold still. Many children have incredibly sensitive scalps or are just incapable of sitting still. And expecting someone to create a masterpiece when the entire canvas is moving all over the room is unreasonable at best. With all that said, we do not have an age maximum, and have had Great-Grandmothers get their hair done along side their Great-Granddaughters. If your child has a bob hairstyle, or shorter, and you or she wants the “Fairytale Princess” hairstyle you have to realize that it isn’t going to look like the picture. You’ll be fortunate if they can actually make a whole, full bun on top of the girl’s head. Your best bet is to go with the “Disney Diva” or the “Pop Princess”. Two hairstyles that ADD hair, as opposed to using the hair that’s already there. We also aren’t allowed to deviate from the hairstyles offered because we aren’t licensed cosmetologists, so please don’t make requests that stray from our training. If Princess Doesn’t Want to, Don’t make Her. I’ve had many girls who either due to the unruly atmosphere, lack of sleep, or simple desire to do something else freakout and decide either before, or during that they didn’t want to do it. Though one of the largest issues I contend with, are Mother’s that make the decision for their daughters, that they’re going to do it. I understand that it’s your dream to have your little girl turned into Cinderella because it’s what you would’ve wanted to do when you were a child, but sadly a lot of kids get into the Boutique and witness the absolute zoo it can be in the afternoon/evening and quickly have a Level 5 Meltdown. This isn’t the time or place for you to try to assert this on her, and ultimately it’ll just create a really ugly scene in front of a lot of people. No, You Haven’t Paid Yet. You aren’t charged for your visit to the Boutique until you’ve completed your transformation, so expect to pay afterwards. When they ask for your credit card number during reservations it’s merely to make certain that you’ll show up. We Aren’t Allowed to Solicit, But We Are Allowed to Accept. If you feel that the service you’ve received was worth a gratuity (many do), you are allowed to Tip your Fairy Godmother-in-Training, and any other Fairy Godmother that you choose. However, you will have to do it in cash, as the Fairy’s at the register aren’t allowed to charge Tips on your credit/room card. Above and beyond everything else on this list, you should make having fun the Number 1 Priority! This isn’t a chore, and you aren’t in a cubicle, so don’t be grumpy! This is the Bibbidi Bobbidi Boutique in Cinderella’s Castle, and currently the only Boutique in any of the Disney Theme Parks. It’s a privilege and an honor for you to be a Guest, and every Fairy Godmother-in-Training is more than willing to meet any and all of the challenges you have for her with a smile, a great story, and three very magical words. So if things “turn south” during your vacation, keep in mind that all you need is Faith, Trust, and a little bit of Pixiedust, and everything will be alright.